Over the next few days, we will be publishing three pieces on the crime of aggression. With the first post, JiC welcomes Teddy Nicholson, an MSc International Relations student at the LSE with an avid interest in the subject. In this thoughtful critique, Teddy takes aim at the lack of attention paid to the crime of aggression which, he argues, has the potential to fulfill the real Nuremberg Legacy. Enjoy! 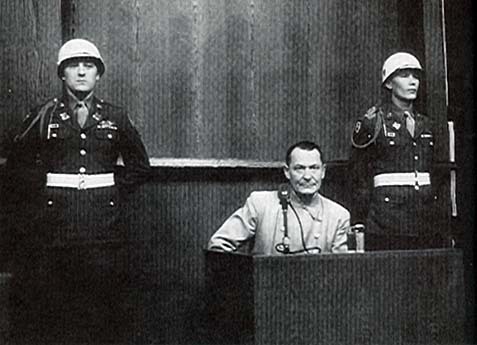 Former Nazi second in command, Herman Goering, sits in the dock during the Nuremberg Trials. One of the less discussed but more remarkable developments in international criminal law was the agreement in June 2010 at the ICC Review Conference on the crime of aggression. The codification of laws against aggression has the potential to be one of the most profound shifts in the underlying institutional architecture of international society since the signing of the Rome Statute in 1998 and perhaps even the creation of the United Nations in 1945. What makes the situation more remarkable is how little attention has been paid to the crime of aggression. What really brought this home to me was a discussion I had with a high level official from the Office of the Prosecutor of the ICC shortly after the review conference who told me that the OTP was paying limited attention to this new crime under the Court’s jurisdiction. This lack of interest in the subject was reinforced at a recent talk by an eminent jurist with a long career in international criminal law. When I asked him about the development of the crime of aggression, he gave a vague and generic answer which betrayed a lack of engagement with it. I have since become increasingly convinced that this is because those who work in or around the Court on a regular basis tend to see the core mission of the ICC as fitting in with a human rights agenda and don’t know how to deal with the crime of aggression. I have made some strong claims for the crime of aggression. In order to justify these, we need to take a look at the history of the crime. There is a common narrative of international criminal law that treats the ICTY, ICTR and ICC as fulfilling the ‘legacy of Nuremberg’. This involves telling a story in which Nuremberg was a response to the hideous human rights violations in the Holocaust, and was followed by revolutions in human rights centered around the Universal Declaration of Human Rights, the Genocide Convention and the Geneva Conventions. International Criminal Law was then put on ice for 50 years by the Cold War until the 1990s when tribunals were established that would finally give teeth to the long-gestating international human rights movement. The problem with this story is that it is an ahistorical account of what the Nuremberg International Military Tribunal (IMT) represents. Rather than the IMT being institutionally complementary to the human rights movement, it was designed to complement the UN Charter. It is often overlooked that the main crimes for which the Nazis were tried for were not crimes against humanity or war crimes, nor genocide (which hadn’t been codified), but crimes against peace – what we now call the crime of aggression. The judgement at Nuremberg stated that aggression is “the supreme international crime, differing only from other war crimes in that it contains within itself the accumulated evil of the whole.” This reflected a belief at the time that, while the Holocaust was genuinely evil, the key act that had to be extirpated from the international system was aggressive (i.e. not defensive) inter-state war. This was the key mission of international criminal law and was intended to be complementary to the new UN Charter, the purpose of which was the political prevention of aggressive war through the Security Council. It was the prevention of war, rather than the defence of human rights, that was the principal concern of the international community in 1945. By the time the Rome Statute was drafted in 1998, beliefs had clearly, and legitimately, changed. The decline in inter-state war had given way to a rise in intra-state conflict and massive human rights abuses by governments against their people, most notably in the Balkans and Rwanda. Humanitarianism and human rights had replaced aggression at the top of the international agenda. The crime of aggression was negotiated over the course of a decade in a small working group that met regularly at Princeton University. The definition proved relatively easy to agree upon, since the UN General Assembly had defined aggression in 1974 and the definition seemed uncontroversial. The biggest fight was over the conditions for the exercise of jurisdiction. And this is ultimately why the crime of aggression matters so much, even if aggressive inter-state war is looking increasingly like a thing of the past. 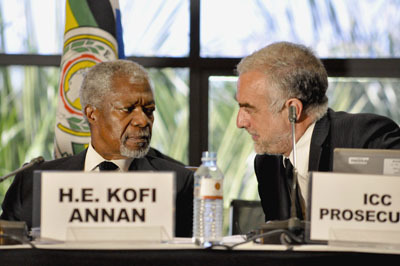 ICC Prosecutor Luis Moreno-Ocampo (r) and former UN Secretary General Kofi Annan (l), speak at the ICC's Kampala Review Conference. The final sentence in article 5(2) of the Statute requiring any amendment to be consistent with the UN Charter is referring to Article 24 which grants the Security Council “primary responsibility for the maintenance of international peace and security.” The idea of giving the ICC jurisdiction over aggression risked setting off a turf war between the Court and the Security Council over whether there is to be a legal or political response to war. This was also a chance for the most powerful states to reassert political control over the development of the ICC through filtering jurisdiction over aggression through the Council – a measure inconsistent with the concept of judicial independence. To the surprise of all concerned, at the ICC’s Kampala Review Conference, the amendments adopted did not include the proposals being pushed by the UK and France (with the US not so subtly ‘observing’); all state parties consented to a package of amendments that accepted that the Security Council had primary, but not exclusive, responsibility for international peace and security. Therefore, aggression would be treated like the other three crimes, allowing the prosecutor to launch an investigation proprio motu (on his own volition) without prior UNSC approval. Big compromises were made for this: the entry into force regime allows states to opt out far too easily, and delays any real action until 2017 (which partially explains the lack of attention paid to it). However, now we have a resolution agreed by consensus in the Assembly of States Parties that, for the first time, proposes a change to the institutional architecture of international society which considers aggressive war a crime that should be prosecuted by a court, rather than a political action that requires a political response. The ICC definitely does have a core humanitarian and human rights focus, but it also represents a key part of the constitution of international society, adding individual accountability to acts that were previously considered the legitimate acts of states. This is true nowhere more than with the crime of aggression. Maybe the Court will never try anyone for it, but the Kampala agreement genuinely represents a step towards fulfilling the legacy of Nuremberg in which war is dealt with by the political powers of the United Nations and also the complementary legal powers of the International Criminal Court. 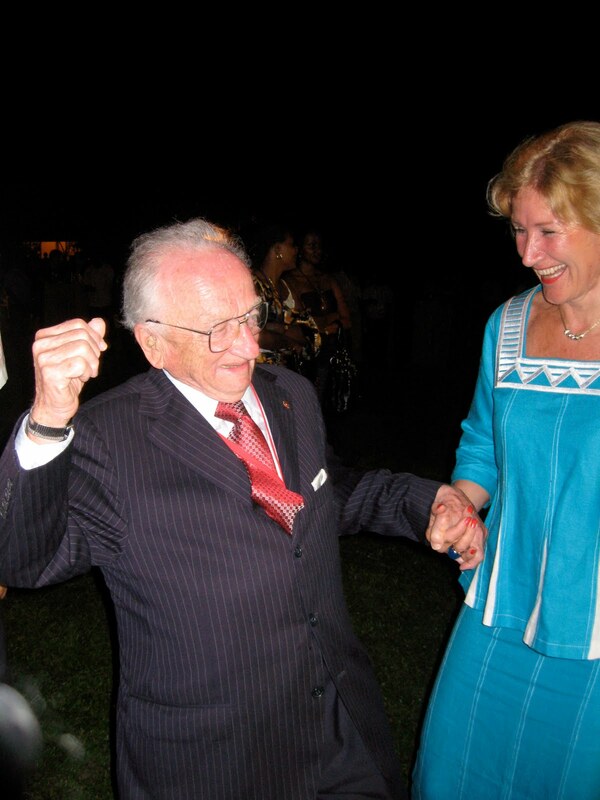 This entry was posted in Crime of Aggression, International Criminal Court (ICC), Nuremberg Trials, UN Security Council. Bookmark the permalink. Do you think there is any hope and potential for seeing such countries as the US and UK (the biggest and most frequent perpetrators of aggressive war in the world today) who in acts of ‘aggressive war’ invaded and occupied Iraq, Afghanistan, and Haiti, and are engaged in various ‘shadow wars’ and drone strikes in other sovereign states, tried in and punished by the ICC under these amendments? Thanks for the reply. I’m not going to get into a debate here about the varying legal issues at play regarding US/UK interventions in the various countries you mentioned, though I may consider them in a future post. What I will say is that even if you do consider these examples of aggression, there is practically no chance that the leaders of these states will ever be tried at the ICC for them. This is because firstly even if these amendments do come into force it will not be until 2017 and the ICC has no retroactive jurisdiction and secondly because the states in question are able to quite easily opt out. The US has not signed the Rome Statute and is unlikely to do so, the UK has and we will see in the coming years whether it will ratify the Kampala amendments or not. One interesting point to note which I didn’t cover in the post is that aggression is defined partially as a “manifest violation of the UN Charter” and manifest means that the act by its “character, gravity and scale” violates the charter, and all three criteria are necessary together. This is taken to mean that a war such as that over Kosovo in 1999 which was done without UNSC approval but was arguably in service of the goals of the UN as a humanitarian intervention, would not fulfil the “character” element, and thus not be considered aggression. I’ll discuss this more in a later post, but it’s something to consider when discussing wars that some may consider aggression – the threshold has been drawn at a high level.